CEJA and CEJA Action are proud to release our 5th Environmental Justice Scorecard for the 2017 Legislative Session. This scorecard is the only one in the state to assess how well California’s elected officials supported actions to address environmental issues that impact low-income communities and communities of color. 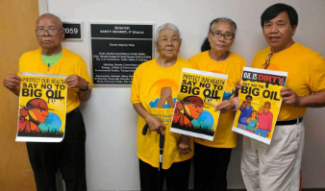 In 2017, there were many high profile pieces of legislation signed into law, and many of these deals included tough compromises with significant impacts on environmental justice communities. The year revealed ongoing gaps in legislative leadership on EJ, and the pervasive influence of industry in California politics, even in a state that is heralded as an environmental leader. Over the course of the 2017 session, we saw policies shaped in ways that negatively impact their transformative potential to meet the urgent environmental health, justice, and climate crisis in overburdened communities. The 2017 legislative session showed that the stakes are now higher: for legislators to be EJ champions, they must do more. There were still bright spots in the session such as passing AB 523 by Assemblymember Eloise Gomez Reyes, which will bring approximately $60 million dollars for renewable energy in disadvantaged and low-income neighborhoods. 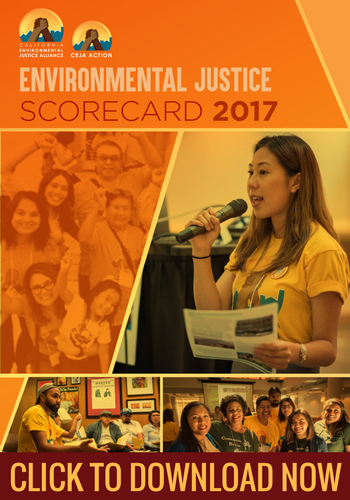 Click here to download the full 2017 Environmental Justice Scorecard! How did legislators score on environmental justice? After the last few years of steadily increasing scores since our 1st EJ Scorecard in 2013, this year’s scorecard shows a sharp decline in the scores of Governor Brown, legislators, as well as cumulatively across the API, Latino, and Black Caucuses and regions across the state. Given the number of important issues still pending in 2018, there are many opportunities for legislators to increase their support for EJ in this legislative session. There were 2 perfect 100% scores in 2017. 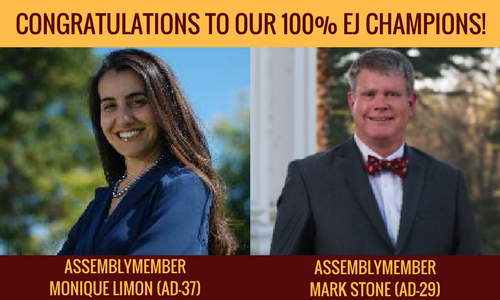 We congratulate Assemblymember Monique Limón and Assemblymember Mark Stone for their steadfast support of environmental justice in the 2017 Legislative Session. 1 Senator and 6 Assemblymembers received high scores: Senator Allen received a score of 93% and Assemblymembers Weber, Gomez Reyes, Kalra, Gloria, Chiu, and Bonta all received a score of 92%. These numbers are in stark contrast to 2016, when 38 Assemblymembers and 22 Senators scored in the 90-100% range. Governor Brown scored a 70%, indicating his significant room for growth in supporting environmental justice issues. This is a sharp decline from his perfect 100% score in 2016. We saw the highest regional scores from San Diego (87%), with Bay Area (77%) and Los Angeles (70%) following with room for improvement. The San Joaquin Valley (35%) consistently shows the lowest scores, even with some of the highest pollution in the state. The API Caucus had the highest cumulative score of 85% and has historically been one of the strongest supporters of EJ issues with a strong cohort in 2017 that scored above 90% among 11 members. As the smallest caucus with 10 members, the Black Caucus scored 73% – down from 87% in 2016. With 25 members, the Latino Caucus is the largest caucus and overall had a score of 79% in 2017 – a decline from 94% in 2016. In 2018, the bar for being an EJ champion is higher than ever: the environmental health and climate crises have worsened, but our movement has grown and we need leaders who will grow with us. Given the sustained and significant impacts of environmental and health hazards among communities of color, legislators of color have a particular responsibility to represent the needs of California’s increasingly diverse population. With increased awareness of EJ issues in the Capitol, it is now time for legislators representing communities of color to show stronger leadership on our issues. With a federal-level attack on low-income communities and communities of color, California’s resistance is a bright spot in national politics. But the 2017 legislative session showed that our elected officials – now more than ever – need to rise to the challenge. We need leaders who will stand with our communities, despite industry pressure. 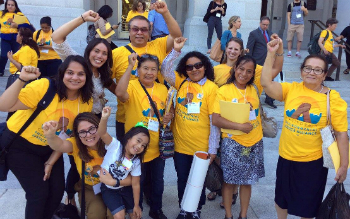 CEJA and CEJA Action will continue educating elected officials about environmental justice issues and building the political will to enact the bold policies our communities need, while holding our leaders accountable when they do not.